Car Free Day- Main Street « Vancouver Spotlight – Your Station! Your Stories! Cara Yeates is on Main Street amidst crowds of thousands for its annual Car Free Day. Letting fun happen for free, allowing people to experience their community and the individuals who make up that community is the aim of Car Free Day. With people of all ages dancing on the streets, kids painting chalk, musicians jamming everywhere, nothing but good seems to come from this event. Skateboarding demonstrations, grass roots organizations from all communities of Vancouver, face painting, families out together is what makes up the crowd, and it seems that with the number of people out to celebrate the freedom of the street, a citywide Car Free Day would bring nothing but happiness. 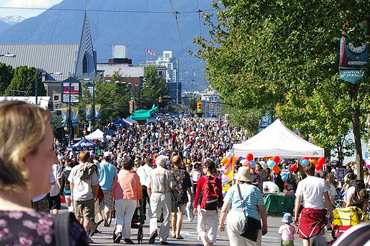 For more information on next year’s Car Free Day, visit www.carfreevancouver.org for more information. This entry was written by vanspotlight and posted on October 23, 2008 at 1:06 am and filed under Family Activities, Music, Outdoor Activities with tags car, car free day, commercial, community, day, drive, event, free, main, outdoors, street. Bookmark the permalink. Follow any comments here with the RSS feed for this post. Post a comment or leave a trackback: Trackback URL.